In 1907, year of the worst bank run in U.S. history, a certain Nelson Aldrich – whose daughter later married into the Rockefeller oil dynasty – was commissioned to find a solution to America’s banking woes. Like a true agent of the elite, he went to Europe for a couple of years and studied their Rothschild-styled central banking systems. This trip produced the favorable political backdrop for the formation of the Federal Reserve in December 1913. Over the past 115 years, many monetary experiments have been implemented by the FED’s officials, but, to me, one quote says it all: “Permit me to issue and control the money of a nation, and I care not who makes its laws!” This famous quote from the Rothschilds proves just how powerful of a monopoly banks wield against the general population. 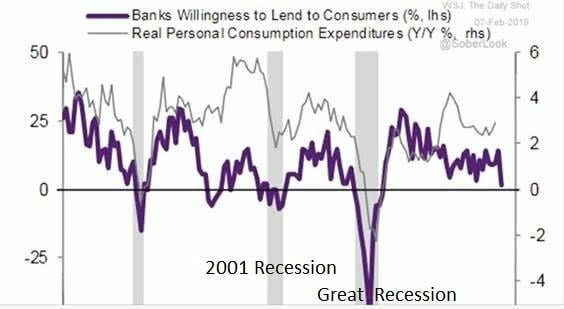 Currently, as the below chart shows, banks are tightening the noose around consumers, which leads to relatively low inflation – opposite of what I anticipate when banks open up the credit hoses in a couple of years. Banks are deliberately holding back. They’re suffocating consumers, in preparation for the “Big One,” the reset that will shock people worldwide, if it occurs, but for now, we’ve been able to avoid it. Their appetite for creating booms and busts in the credit markets goes back hundreds of years.As you can see, times of credit contraction coincide with market bottoms, not with peak euphoria. The banking system is signaling that we’re already in a slowdown, not in a boom. On the flip side, there is overwhelming data to the contrary, suggesting a growing economy. These conflicting data points are puzzling investors at the moment. 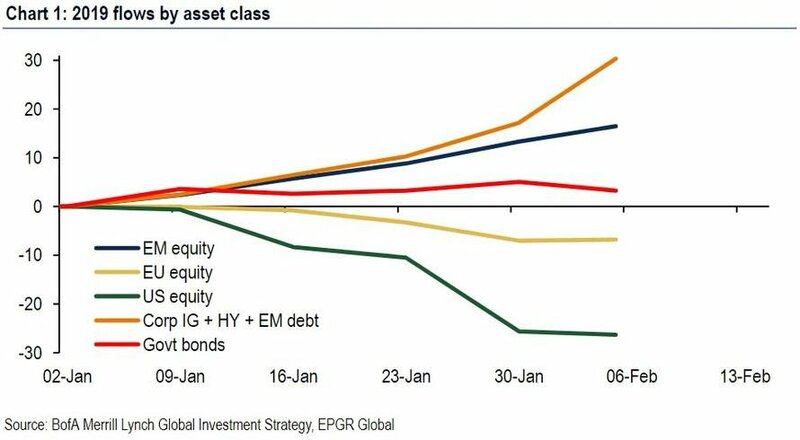 The investment community is currently trading in such a rare fashion, the likes of which we haven’t seen in over 3 decades because as stock prices rose in January and in early February, funds kept flowing out of the markets, rather than into financial instruments. It looks like much of the rally has been nothing but short-covering. This is a unique anomaly and it will be critical to see how this plays out in the coming weeks, as more tariffs are due March 1st, if no deal is struck. Couple that with the wall debate that is set for next week and you’ll get a picture of two major political events, which will shape this year’s outlook. The 2018 USD shortage is coming to an end, so investors are following Ray Dalio’s advice by moving funds into emerging markets. Emerging markets are ridden to dollar debt, so fresh liquidity of American currency will help alleviate this horrific situation. Wealth Research Group has been covering the phenomenon of “de-dollarization” for over a year. Foreign exchange reserves have plummeted from 72% in 2000 to 62% presently. In other words, nations are increasingly looking for alternatives to the world’s current reserve currency. Like we’ve said many times, some people remain in a loveless marriage for years and even decades because they fear the alternative. 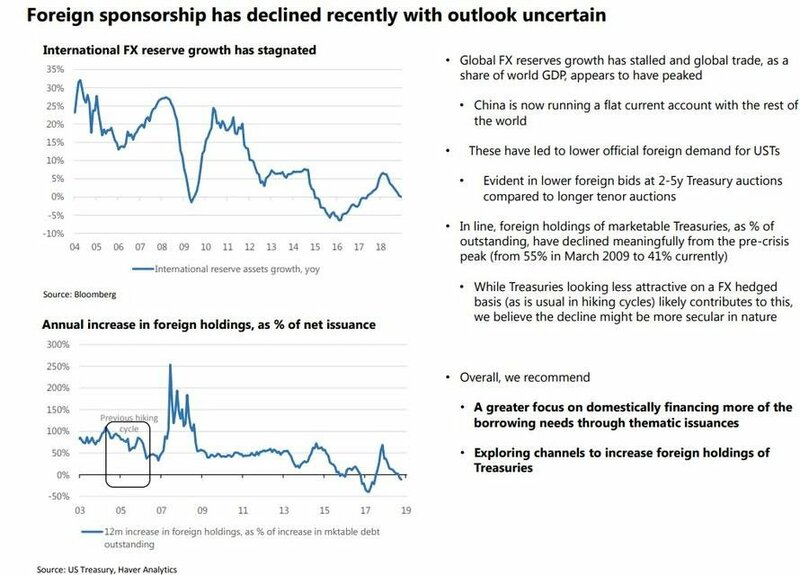 In the same way, the USD maintains supremacy, but not because foreigners are passionate about it. It’s for the same reason an unhappy couple stays together – the fear of embarking on an unproven path is even greater. The Treasury Department is stretching the limit of this relationship with foreigners, however. The stock market is heading higher, while the credit investors are betting on a sell-off. Historically, credit investors have been right more often than stock market participants. There’s just an unusually high level of discrepancy between the bears and bulls camps. On one hand, billionaires like Ray Dalio and Jeff Gundlach are comparing our present reality to that of 1937, mostly because of the global rise of populism. 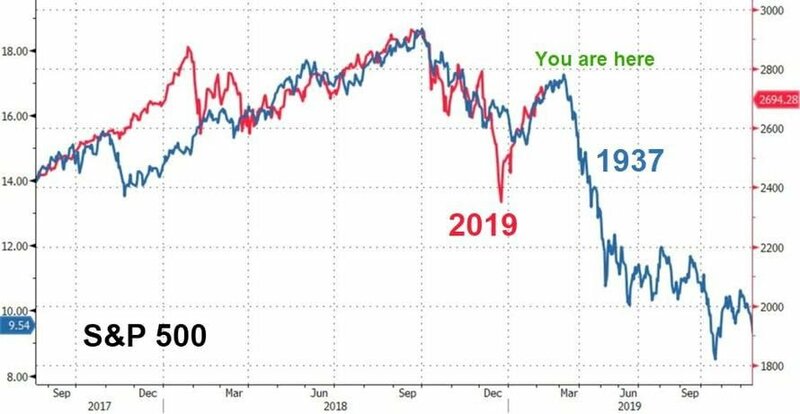 Gundlach actually believes we are already in a bear market. On the flip side, similar to the Asian Financial Crisis of 1998 that sent the markets into a nose dive (eerily similar to the one we just went through in December), the bulls expect a trade deal to materialize, followed by a euphoric rally. In fact, the S&P 500 is mimicking its trading patterns with the late 1990’s just as similarly as it does with the chart of the late 1930’s. Every time the market took a beating, bulls kept on bidding it higher. If you compare the chart to the 1997-2000 timeframe, you’ll notice a striking resemblance. If stocks continue trending up, breaking all-time highs, the sentiment will change altogether and we will see the Blow-Off Top storyline playing out. If populism accelerates, bears will make this look like 1937, and we will re-test the December lows and even plummet into a bear market. Therefore, I plan to trade in this situation by “living” it and breathing it. In case of a rally, my strategy is to sell into it any holdings that behave poorly in recessions by analyzing their performance in the 2007-2009 era. Those that were weak back then will most likely show reduced earnings this time around as well. The other possible route is a big sell-off; I’ve prepared a Watch List of companies that I’ve been following for years, but haven’t been able to invest in. Either their valuations had been too rich at the time, or I wanted to increase my position in current investments. The Watch List is divided into three, and today I will publish Part 1. It is comprised of the stocks that are closer to their bargain territory range and thus more likely to become a BUY during a correction. Buying dips in companies that I’m already familiar with is the safest investing strategy for me. There’s a company that meets all of these strict criteria that I’m looking for and trades within cents of my personal Bargain Price Range for it. I’m tracking the technical analysis patterns for it, and could be pulling the trigger on it within days. I plan to release a time-sensitive publication with all the details THIS WEEK. Right now it is, by far, the No.1 stock on my radar screen. The charts indicate that it could erupt at any moment, but I’m still looking for a final confirmation of a proprietary signal that has worked for me time and time again. Insurance giant Aflac (AFL) is one of the best-performing stocks in history. It has even outperformed Warren Buffett’s insurance-focused Berkshire Hathaway – that’s huge. Only a handful of stocks have ever accomplished this feat. Buffett sees the value of insurance companies that pay dividends, and Aflac is a true Dividend Aristocrat that has increased its dividend payments for 35 consecutive years. The company’s earnings-per-share of $1.02 increasing 27.5% year over year, looking at the Q4 release. This is a company with a balance sheet that is reminds me of a fortress. Aflac’s total assets are worth $140.4 billion, increasing by 2.3%, compared with a year ago. Moreover, as of December 31, Aflac’s total investments and cash were $126.2 billion, up 2.1%. This is a cash monster. Even during the Great Recession, Aflac’s business was like a rock with a 2009 earnings-per-share increase of 49% and a 2010 earnings-per-share increase of 31%. In order to build a position that will become one of the best investment decisions we’ll ever make, I plan to remain patient. My entry price stands at $41.67. If shares reach that level, I’ll be buying and Wealth Research Group will publish an updated alert. My highest priority potential buy, except for the company that I’ll release details on during this week, is the retail pharmacy chain Walgreens (WBA). It was founded over 100 years ago in Chicago. Walgreens has increased its dividend payments for a 43 consecutive years. Very few companies have such a durable competitive advantage. Stefano Pessina, Walgreens’ CEO since 2015, is a magician. I consider him to be one of the top 10 CEOs of all-times. He is helping WBA to grow faster than the overwhelming majority of businesses on the planet. I also love the way Walgreens is leveraging strategic partnerships to swallow competition and to increase dominance. For instance, Walgreens has partnered with UnitedHealth to implement their MedExpress Urgent Care centers in 15 Walgreens locations. Walgreens has also partnered with Kroger, by introducing Kroger Pickup and Kroger Brand in 13 Walgreens stores. In addition, Walgreens is working with LabCorp to open 600 LabCorp patient centers in Walgreens stores over the next 4 years. WBA is revolutionizing the pharmacy industry, as I see it. I’m already a shareholder of Walgreens. Wealth Research Group first announced WBA as our top dividend-payer, when shares traded for $63. We’re already up 11.1% and the company keeps getting better. As a result, I’m raising the buy-up price to $67.50. Shares currently trade for $70, so we’re pretty close to bargain territory. Even at $70, this is the best opportunity in the dividend sphere today. The last company in part 1 of the Watch List is Leggett & Platt (LEG), a manufacturer of residential bedding and furniture. It’s an exceptional business. What I love about this set-up is that it remains under the radar for most investors, but I have been tracking it for several years. It has a superb dividend yield of 4.2%, and a 46-year history of consecutive annual dividend increases. Their Q4 2018 sales grew 6% to $1.05 billion, with their full-year 2018 sales increasing 8% to $4.27 billion. The company is definitely in growth mode. In 20 years LEG could become a Fire and Forget investment that compounds at 1.5x the index performance or better. Because it’s smaller than Walgreens, it’s more volatile. In December, it fell to $36.00 per share so I built a small position. Right now, it’s trading over $43, but if we see another correction where shares reach $36.89, I plan to double my position size. I’ll release Part 2 of my Watch List, which includes 5 additional stocks later this month. This is going to be a record-setting year for us.